I know its raining but no, you can’t come in! Lou in another squall. Some Maths homework on route. H – Impervious to seasickness and able to sleep anywhere. Some of Lou’s preprepared meals ready for the off. There is a little of an overlap in this post as I think Lou will cover our few days stay in San Salvador as a separate post. However, the purpose of this post is to write up the passage between Georgetown and BVI, the longest passage we will do this year and the longest that Lou and the girls have done. The passage to the BVI from the Bahamas is done in two ways and as I have explained in the selection of the route, we choose to do the direct route which required us to push out E well in to the Atlantic Ocean, bypassing all the other interesting places we could have stopped at such as the Turks and Caicos Islands, Dominican Republic and Puerto Rico. The trip measures about 800Nm, a little less on the rhomb line (the shortest line between any two points on the Earth’s surface) but this course is near impossible and the offshore route is normally done by heading E to the 65W longitude line then heading directly S to the BVI to “get around” the normal trade winds which come from the SE. It is otherwise known as the I-65. We provisioned up in Georgetown and then took an overnight jump to San Salvador to get a little easting out of the way to wait for the main front that we needed to push across towards eastwards. The marina at San Salvador isn’t great. It was an expensive investment by a family that own a small hotel a little up the road which hasn’t quite worked out. I had a good chat with the youngest son in the family who was running the bar. They had hoped to bring sailors out to San Salvador. The difficulty, whilst there is fantastic diving opportunities, there are no safe anchorages around the island unless it is a flat calm and the island is 50 miles offshore. Most people bypass it either heading S towards the Turks or keep closer to the main islands to the W.
The unmanned harbour is now the home of four fishing boats that service the Club Med resort on the island and a couple of dive boats. Whoever did the harbour design didn’t take into account the surge that the harbour experiences from the N and W and whilst they have added 100m of breakwater boulders it hasn’t made a huge amount of difference. Any kind of sea running from those directions, it is a lumpy and noisy ride inside the harbour. We did meet some interesting people at San Salvador. We had Jim, an American who was about to fly back to the USA, and Eric and Jen, the couple who were going to sail the boat back for him. Eric and Jen were a lovely couple. Eric bought his yacht, a 29’ sloop at the age of 19 and has been a liveaboard ever since, working when he needs to build up the funds and sailing when he has the readies. Jen is another free spirit. The pair of them put up with our small people hero worship wonderfully. H came away with a couple of dresses from Jen and E was paid for some hair braids she did for Eric with a kite. Great fun! Having spent our time usefully catching up on email, blog and lots of cooking of premade meals that would just need reheated, the weather eventually started to turn with the wind looking to move into the SE as the start of the front came through. We pushed off on the 9th Feb in about 20kts of wind and headed around the S tip of the island. The next two days were lumpy to say the least. Although the wind had turned, the seas that had built up with the E wind were unpleasantly large and short. Skylark is great off the wind but struggles (as most cats do) going to windward. We were having to head far further S than I wanted or expected but with no real options that was what we had to do. The girls spent most of their time conserving energy and reading. It wasn’t much fun for them but they were stoic about it and made Lou and I’s life as easy as they could, which was much appreciated. A note on our watch system. We used a three on, three off for dark o’clock hours, mixed with 4hr stags which were more manageable during the day. If there was trouble or a sail change was needed it was all hands on deck. It meant that ever 2nd day you would get the chance in daylight hours of some decent sleep. It actually worked pretty well for us and although we were tired when we reached the BVI’s, we weren’t exhausted. Over this first period the wave changed from big E sea to mixed rubbish, then to the W sea that I’d hoped for. The waves were steep and short. With the wind gusting 30+ knots at times it was exhilarating sailing but sometimes a bit too much. We got faster and faster as the waves built up and occasionally decided to take us with them. We also spoke to another yacht “That’s Life” who were heading to Puerto Rico and compared notes and strategies. With no planning or coordination at all, we were to stay in contact with them by VHF for the next 4 days. One of the crew, a long term immigrant to the US, was from Dunfermline. It’s a small world. By this time we had a v small jib flying out but were still managing 7-8kts. Our surfing speed maxed out at 16.9kts. Scared the willies out of us. The 12th and 13th gave us two days of slowly weakening wind, the mainsail finally saw the light of day again and we had the fishing lines back out, catching a Mahi Mahi which fed us a couple of days. We also had some surprising visitors. Whilst I have seen plenty of dolphin play around boats I have been on, I have never had two whales turn up and play the same tricks. First I knew about them was one of them surfacing 5m from the boat and exhaling. It was pretty big – somewhere between 20-30 feet. They spent about 30 mins around us, riding the waves just behind us, charging past us and generally looking as if they were having fun staying close to the boat. On the 13th as the wind died to nothing, we had one of the engines on most of the day just to keep us moving. We had reached the 66W line but still had 120 miles to go before we could safely turn S to reach the BVIs. The 14th was filled with squalls and rain, giving the boat a good fresh water flush but meaning that the sails were up and down a fair bit. The rain at times was spectacularly heavy. The forecast that we were getting from my father, sent out daily on the Delorme InReach by text message suggested that the wind would hold up long enough to allow us to push SE direct for the islands. A comment on weather forecasts here. In the Bahamas, we learned quickly that you simply could not trust a forecast any more than 48hrs ahead and frankly you were sensible to be suspicious any more than 24hrs. Whilst the forecast passed on by Dad was generally grossly accurate, we experienced far more wind than forecast (generally by 5-10kts) and the trending that we had to rely on for the last couple of days was wildly wrong. At one point the forecast E trending SE was a W. Confusing how a super computer can be so wrong. Once we were about 50 miles off the BVIs we decided we had fought the wind enough and the engine went back on to take us in to Jost Van Dyke, our closest port of entry which we thought we could just reach before last light. After six days at sea, Lou’s cry of “Land Ho” on the morning of the 15th was wildly celebrated. The BVIs are completely different from the Bahamas where you would be lucky to spot an island any more than 5 miles off, so flat are they. The BVI hills are high and we spotted Jost over 20 miles away. Just to help us in, the wind decided to wander into the W for our last few hours. We rounded the W end of Joest and anchored in Great Harbour with an hour of light left. We cleared in the next morning at the small police station come immigration/customs office. The main street on Jost remains a sand track which was delightful. The island finally got electricity 20 years but it still has a very relaxed feel about the place. We celebrated our arrival with our first “painkiller” rum cocktail at Foxy’s, one of the bars of the Caribbean. It went down well. 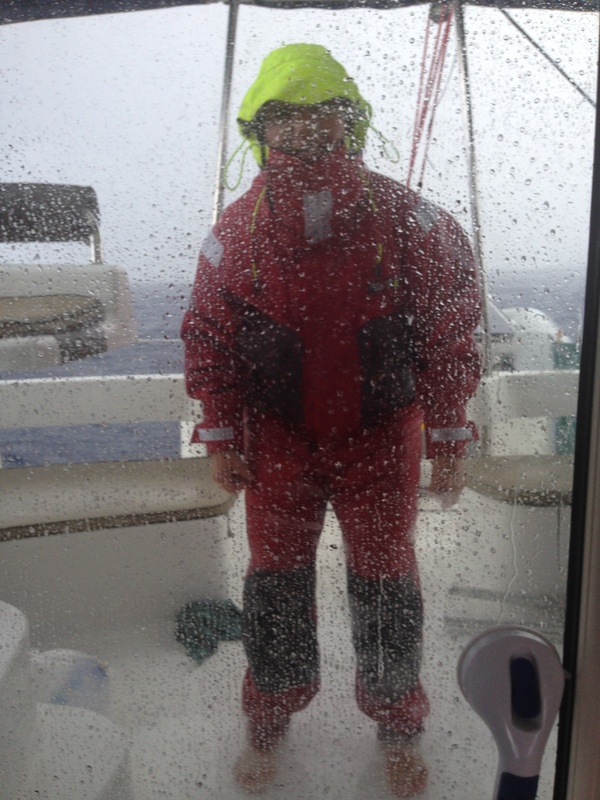 p.s Our friends Eric and Jen who were delivering a yacht back to the US had a more difficult trip. With a complete electrical failure and a front coming through on them with gale force wind, they were only able to get as far as Staniel Cay, half way up the Exumas before they had to stop for repairs. They are currently heading back to their own boat at San Salvador having managed to hitch a lift there with another sailing couple.